The IRC is American University’s “football team,” and it is expanding every year into something of its own league, while the ARCCF preserves U.S.-Russian history. When Dr. Peter Starr, dean of the college of Arts & Sciences at American University (A.U.) and honorary co-chair of the Initiative for Russian Culture (IRC) took to the stage at the National Building museum on Oct. 8, his words may well have been the most meaningful of the evening. This is an extraordinary statement in an era that has seen a discernable lack of interest in Russian studies when compared to other languages and cultures. In the United States, it is difficult to find high schools where Russian is taught, and most college freshman find themselves in rather small classes for Russian 101. At the press conference before the festivities, Anton Fedyashin, executive director of the IRC, acknowledged that Russian studies in the United States essentially begins in college. And even at the college level, the pace has been lackluster. But American University wants to change all that. Fedyashin also announced at the conference that in the three years since the IRC was founded, the number of students in the program has quadrupled. The IRC has wisely opened up this initiative to area colleges in Virginia, Washington, D.C. and Maryland. At the Russian Embassy on Oct. 7, the American-Russian Cultural Cooperation Foundation (ARCCF) celebrated its 21st year with a sparkling black-tie gala that seemed to celebrate lots of things, but most of all the 150th anniversary of the Russian Navy’s goodwill visits to New York and San Francisco. 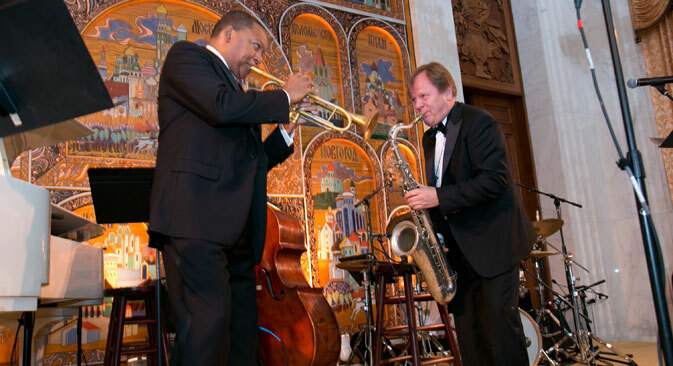 American jazz great Wynton Marsalis performed at the gala with virtuoso Igor Butman, starting their performance with Rimsky-Korsakov’s “Flight of the Bumblebee,” a work Marsalis somehow managed to make look elegant on the trumpet. The Marsalis Butman performance, which seemed like a reunion of two old friends, was both spectacular and intimate. IRC’s James Symington Award for Russian studies was awarded to student Rebecca Darnell, which will allow her to attend the 2014 summer program at the Moscow Institute of International Relations (MGIMO-University). There were so many partners, performances, discussions, awards and celebrations over the two nights it was sometimes hard to keep track. A few too many expository videos and self-congratulatory speeches markedly slowed the pace of the Oct. 8 event for students (which was supposed to be at the Library of Congress but was moved late in the game to the National Building Museum due to U.S. government shenanigans). But finally a group of U.S. and Russian jazz students were allowed to perform. There is little doubt that the IRC is showing off its growing influence with an increase in language study, scholarships, and film studies for area students. Those interested in Russian studies can only say, it’s about time.